Open the People page of the Reply interface. Select the contacts you want to export. Expand the More drop down menu. Basic Fields: Email, FirstName, LastName, Title, Company, City, State, Country, TimeZoneId, AddingDate, Phone, LastTouch, ActiveCampaign, Status, OptedOut, InboxCategory, LinkedIn. All Fields: Email, FirstName, LastName, Title, Company, City, State, Country, TimeZoneId, AddingDate, Phone, LastTouch, ActiveCampaign, Status, OptedOut, InboxCategory, LinkedIn + Opens, Views, Sent, Replies, Bounces + CustomFields. 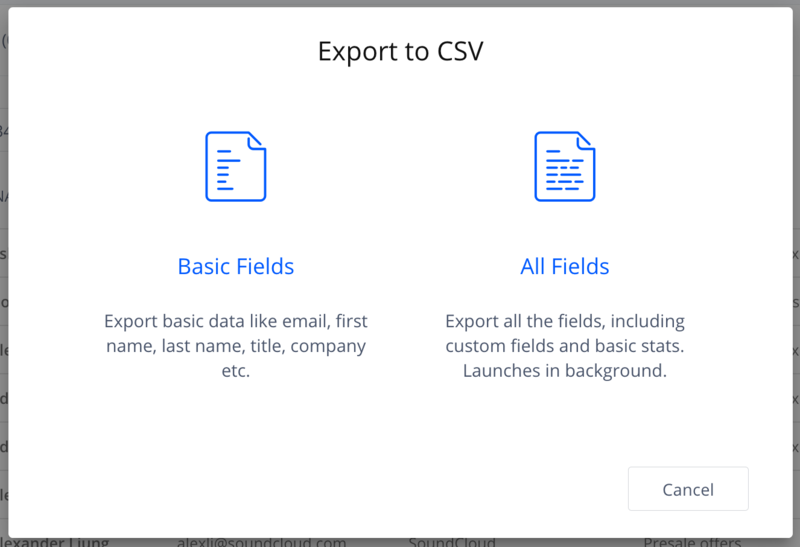 When you export contacts from a specific campaign, the system creates a .csv file named after your campaign.